October 2017-announced shooter finally dated. 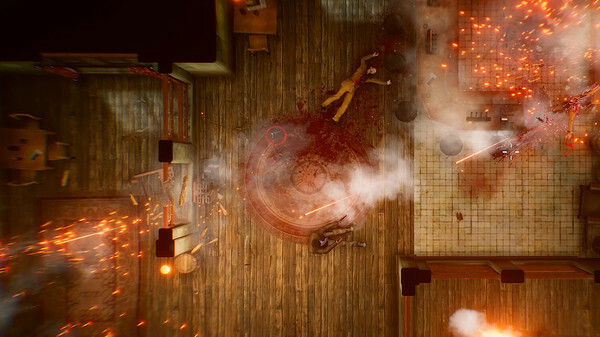 The Hong Kong Massacre, the Hong Kong-set top-down shooter first announced in October 2017, will launch for PlayStation 4 and PC on January 22, developer Vreski announced. Inspired by classic action movies, The Hong Kong Massacre places you at the center of a hard-boiled revenge story, filled with brutal, cinematic shootouts and vivid underworld locations. Take on the role of a former police detective bent on exacting vengeance for his partner’s murder and use of a mixture of raw firepower, slow-motion and dive/dodge mechanics to tear your way through the criminal ranks. Dive through windows or dodge behind cover – every shot is lethal, so stay aware of your surroundings and exploit the environment however you can. When the heat is on, you can slow down time and plan for the next move. Avoiding bullets whilst taking out enemies is crucial for survival – but beware, your slow-motion ability is limited: plan fast, think ahead and bring down the bad guys unscathed. Update 01/22/19 at 4:00 p.m.: While the PlayStation 4 version is available now in Europe and Australia, the American release has been slightly delayed. A release time has yet to be announced.